The Mongols ruled China from 1215 to 1368. Their dynasty was called the Yuan dynasty. Yuan means "origin" or "primal." 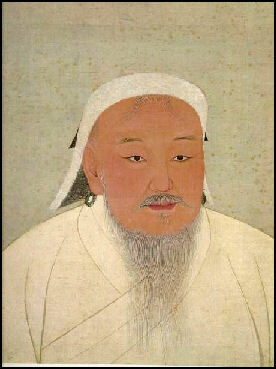 Genghis Khan united the Mongols in 1206. He made his first inroads into China in 1215 when he captured Yanjing (Beijing), then a relatively large city in northern China. The complete conquest of China was left to his grandson Kublai Khan, who reached Linan in 1276 and claimed China in 1279. The Mongol era in China is remembered chiefly for the rule of Kublai Khan. As in other periods of alien dynastic rule of China, a rich cultural diversity developed during the Yuan dynasty. The major cultural achievements were the development of drama and the novel and the increased use of the written vernacular. The Mongols' extensive West Asian and European contacts produced a fair amount of cultural exchange. Western musical instruments were introduced to enrich the Chinese performing arts. From this period dates the conversion to Islam, by Muslims of Central Asia, of growing numbers of Chinese in the northwest and southwest. Nestorianism and Roman Catholicism also enjoyed a period of toleration. The first records of travel by Westerners date from this time. The most famous traveler of the period was the Venetian Marco Polo, whose account of his trip to "Cambaluc," the Great Khan's capital (now Beijing), and of life there astounded the people of Europe. After the Mongols under Genghis Khan (1167-1227) took control of much of Mongolia they set their sights on the Jin, a rich empire in northern China with 20 million people. From intelligence sources such as merchants and defecting Jin civil servants, Genghis Khan learned that the Jin empire was racked with internal problems and vulnerable to attack and that its huge army of 600,000 troops was pinned down on the southern border where the Jins were engaged in a long-running war with the Chinese. Before leaving on the 1211 campaign against the Jin with a force of 70,000 men, Genghis Khan told his people that "Heaven has promised me victory." The Mongols breached the Great Wall of China by advancing through a 15-mile-long gorge with the help of a turncoat Chinese general. The Mongols had little trouble conquering the overmanned and inefficient Jin army. 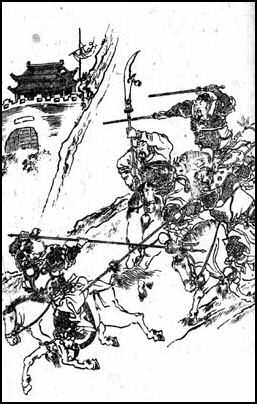 Using the feigned retreat tactic to great success, a Mongol general nicknamed "Arrow" defeated the Jin army in an important battle at Juyong Pass. Capturing the Jin capital of Zhongdu (near present-day Beijing) was more problematic. The 40-foot walls that surrounded the city initially proved to be too difficult to surmount as the Mongol army contented itself with pillaging the Jin subjects in countryside around Zhongdu. In 1214, the Mongols surrounded Zhongdu and used catapults to bombard the city's walls. After a short siege, the Jin Emperor Xuanzong gave up and presented Genghis Khan with a tribute of gold, silver, other treasures and a Jin princess with 500 servants in return for sparing the city. Fearing another Mongol offensive, the Jin emperor moved his capital from Zhonghu southward to Kaifeng in 1214. Suspecting that the Jin emperor might be trying to regroup for an attack, the Mongols laid siege to Zhongdu again and this time pulverized the city and made off with the imperial treasure. Years later when a traveler remarked about a white hill he was told it was composed of the bones of Zhongdu's victims. “The Mongols may have been the most dominant military phenomenon until the atomic bomb. Their army was composed entirely of cavalry, and training on the wild steppe had toughened both horsemen and horses to travel enormous distances at great speed. Warriors learned to sleep in the saddle and to tap their horses’ veins for blood when food was scarce. The tradition of Mongol warfare was raiding; the pattern was to appear seemingly from out of nowhere, attacking settlements, towns, and cities with terrific ruthlessness, as much intent upon terror as conquest and loot. In Europe, they were widely believed to be a scourge sent from God, and during the thirteenth century, their conquests there extended as far west as Hungary and Poland. In the Middle East they occupied the lands of modern Iran and Iraq, extending west through most of Turkey. Genghis Khan’s grandson, Kublai Khan (1215-94) became the leader of the Mongol forces in the east in 1260. He established a capital in Beijing, and determined to conquer all China and rule their as emperor. In 1271, he proclaimed the establishment of a new dynasty, the Yuan, and began a campaign of conquest, aiming south. 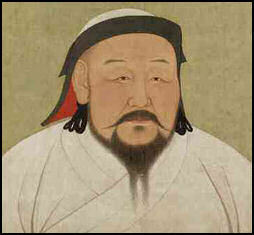 When Kublai Khan became ruler of northern China he tried to entice the Song dynasty into becoming one of his vassals. The Mongols had fought off and on with Southern Song Dynasty for more than four decades. Kublai Khan sent an emissary to the Song offering them good terms if they submitted to Mongol rule. After the emissary was taken captive war broke out. For five years Kublai Khan's army besieged Xiangyang and Fancheng, two important Song cities on the Han River that guarded an important rice growing region in the Yangtze Basin. Using catapults capable of hurling 200-pound stones and a navy of Chinese- and Korean-built ships, the Mongols captured the two cities in 1273. Hangzhzou was captured in 1276 by a Mongol army commanded by the Turkish general Bayan. In 1279, the last Song holdout were defeated. After capturing Hangzhou, Kublai Khan showed more restraint than other the Mongol leaders: the defeated Song army was not massacred; the city's inhabitants were not massacred; and the Song court was allowed to keep some of it wealth and privileges. Even though ordinary Chinese had little affection for him, Kublai Khan united China for the first time in 370 years and was a great supporter of Chinese culture. He put 3 million people to work extending the Grand Canal 135 miles to north so that rice could be transported from the fertile Yangtze Valley to Beijing. He also developed a fast, efficient, pony-express-like postal system that utilized thousands of horses; built roads between Beijing and the far reaches of the empire; reformed the Chinese bureaucracy; encouraged the arts and sciences; developed a famine relief program; and developed the world's first extensively-used paper currency system. Kublai Khan promoted trade throughout the Mongol Empire. To Daidu, Marco Polo wrote: "are brought articles of greater cost and rarity, and in greater abundance...than to any other city in the world." From India came spices and pearls, and "no day in the year passes that there do no enter the city 1,000 cart-loads of silk." Kublai Khan established an agricultural ministry that encouraged farmers to organize communes and distribute seeds and animals. "Before Kublai, the Mongols thought of farmers as useless people, the Chinese historian Chen Gaohua told National Geographic, "But Kublai appreciated them. He knew how to rule a farming country." “During the Yuan period, Beijing became the terminus of the Grand Canal, which was completely renovated. These commercially oriented improvements encouraged overland as well as maritime commerce throughout Asia and facilitated the first direct Chinese contacts with Europe. Chinese and Mongol travelers to the West were able to provide assistance in such areas as hydraulic engineering, while bringing back to the Middle Kingdom new scientific discoveries and architectural innovations. Contacts with the West also brought the introduction to China of a major new food crop--sorghum--along with other foreign food products and methods of preparation. “According to Marco Polo, Kublai Khan said: "There are prophets who are worshipped and to whom everybody does reverence. The Christians say their god was Jesus Christ; the Saracens, Mohammed; the Jews, Moses; and the idolaters Sakamuni Borhan [that is, Sakiamuni Buddha, who was the first god to the idolaters]; and I do honor and reverence to all four, that is to him who is the greatest in heaven and more true, and him I pray to help me." “In the 1340s terrible floods erupted, changing the course of the Yellow River and leaving a large group of people homeless and wandering around the countryside amid much confusion and destruction. Ultimately, some of these bands of unemployed and homeless peasants united into a rebel force, and in the 1350s began the process of ousting the Mongols from China. By the mid-1360s, many of the Mongols had already returned to Mongolia, and the Ming dynasty, a native Chinese dynasty, finally took back control of China in 1368. The Yuan dynasty didn't last long. The Chinese population didn't like the idea of foreigners ruling their country and replacing China's powerful civil servants with Mongols and other foreigners. To maintain control the Mongols courted wealthy landowners, which further alienated ordinary Chinese. After the death of Kublai Khan, the Yuan dynasty became weaker and the Yuan dynasty leaders that followed him were increasingly aloof and paranoid. In the last years of Mongol rule, skittish Khans placed informers in the households of rich families, forbade people from gathering in groups and prohibited Chinese from carrying arms. Only one family in ten was allowed to possess a carving knife. 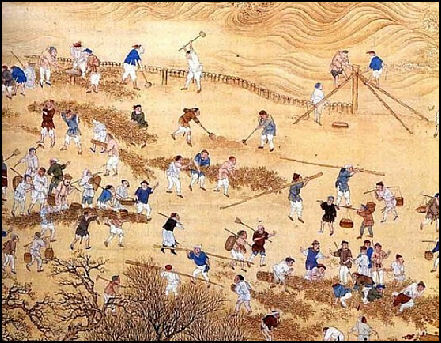 In the 14th century a series of epidemics and famines killed an estimated 35 million people---one in three Chinese. It is estimated that six million died of starvation during the Great Famine of 1333 and 1337 alone. Rivalry among the Mongol imperial heirs, natural disasters, and numerous peasant uprisings led to the collapse of the Yuan dynasty. The Ming dynasty (1368-1644) was founded by a Han Chinese peasant and former Buddhist monk turned rebel army leader. A rebellion against the Mongols was launched by Zhu Yuanzhang (Hung Wu), a "self-made man of great talents" and the son of a farm laborer who lost his entire family in an epidemic when he was only seventeen. After spending several years in a Buddhist monastery Zhu launched what became a thirteen year revolt against the Mongols as the head of a Chinese peasant insurgency, called the Red Turbans, made up of Buddhists, Taoists, Confucianists and Manichaeists. Mongols cracked down ruthlessly on the Chinese but failed to suppress the Chinese custom of exchanging little round full moon cakes during the coming of the full moon. Like fortune cookies, the cakes carried a paper messages. The clever rebels used the innocent-looking moon cakes to give instructions to the Chinese to rise up and massacre the Mongols at the time of the full moon in August 1368. The end of Yuan dynasty came in 1368 when the rebels surrounded Beijing and the Mongols were ousted. The last Yuan emperor, Toghon Temür Khan, didn't even attempt to defend his khanate. Instead he fled with his the Empress and his concubines — first to Shangtu (Xanadu), then to Karakoram, the original Mongol capital, where he was killed when Zhu Yuanzhang became the leader of the Ming Dynasty.